30 individual tracks we love and hope you will too featuring A-Trak, Antony and The Johnsons, Big L, Black Rebel Motorcycle Club, Bonobo, Botany, Carlos Santana, Cee-Lo, Chacha, The Cinematic Orchestra, Cody Chesnutt, Freddie Gibbs, Freeway, Hezekiah, J Rocc, J. Cole, KOKAYI, Luis Visconde, Manzanita y su Conjunto, MED, Nottz, Olivier Daysoul, Om Unit, Rah Digga, RZA, Seiji, Ski Beatz, Skillz, amp; Teebs & more. This month as I was digging through all of this great music and realised I had to create a bonus zip folder. I'm not a huge fan of the hype that surrounds Kanye West but I am a fan of the music he makes. Download "We Love 24.K" here [Mediafire]. 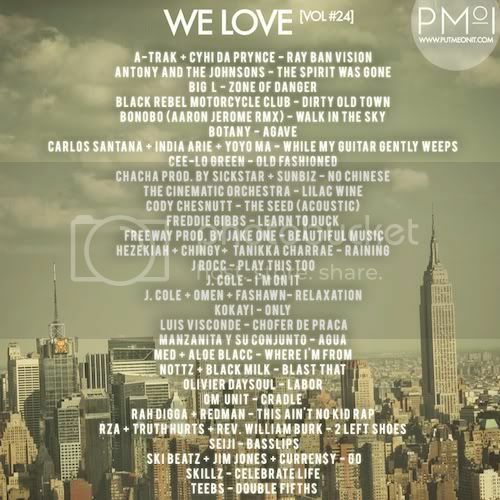 *WE LOVE... is a big one click download of carefully selected individual tracks sourced from reputable blogs & artists we love. Please email us (info@putmeonit.com) if we've uploaded a non-promo track in error or to send us something you love.